Once you have your document ready and loaded in to the designer you have many options for creating and customising your form. You can add Signatures blocks where the Invitee/s will sign and choose from many fields that the primary Invitee will fill such as Name, Address, Company, Date and many more. For some of the fields the service will automatically fill in the details , such as Name, and allow the Invitee to quickly check all details are correct. To Add a Signature block click the Add Sig button on the left-hand side of the designer. To Add Fields click on add Form Control Button at the top, Fields setting menu open on the left-hand side and click on any of the field label in the list or type your own. A field-block with some preview text inside will appear on your document which you can position and resize to where the Invitee will enter the details. To reposition any field or signature block simply use the mouse to drag and drop anywhere on the document. To resize any field or signature block click and drag on the handles or the very edge of the block. If you find your document too small to read and difficult to accurately position then you can zoom the document by moving the slider on the top right -hand side of the page. To save a copy of the form click on the button at the top menu, save as a template. Type the name you'd like to save it as in the pop-up. Now you can use it over and over again without having to go through the setup process each time, and invite more invitees to fill-in and sign online. Once you are ready to send the document, continue to the next step by clicking the next button. Enter invitee details in the pop-up setup the due date. If you have more than one Invitee on your form then whoever is highest on the list will be the one to fill out the form. 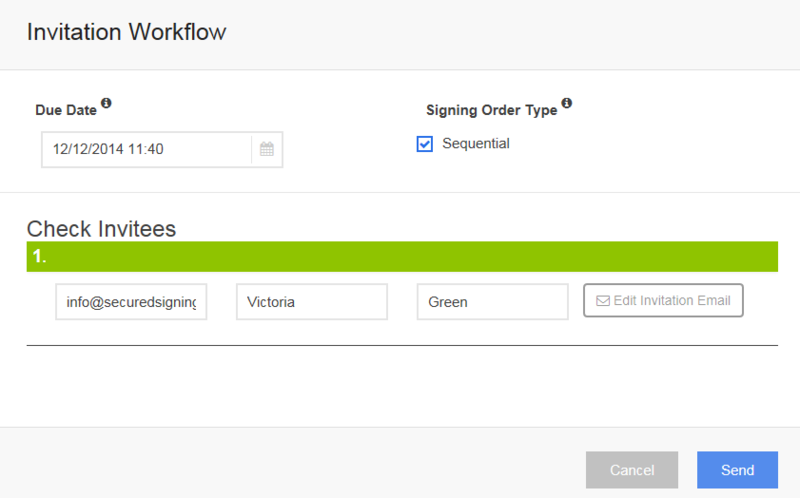 To change signing order click on the green bar and move it up and down. To edit Invitee details such as E-mail, name, just type it in the right place. When you're happy with the workflow click Send to send out all invitations. You can monitor signing progress from your In Progress folder on your My Documents page. Once the Form has been filled in and the document signed then it will be moved to your Signed folder and you will be notified by E-mail.